The East Greenbush Education Foundation, Inc. is an audited 501(c)(3) non-profit organization whose sole purpose is to raise funds to support student achievement. Founded in 1985 and located in East Greenbush, NY, the Foundation is governed by a volunteer Board of Directors. The Foundation awards annual prizes to high school seniors as well as to students for participation in summer enrichment programs. Additionally, the Foundation is the sponsor of the Columbia High School Hall of Fame and the host of the Annual Gala banquet, the premier social event in the community. The Columbia All Sports Club promotes all sports programs in the East Greenbush Central School District for the benefit of student athletic teams and programs. Through the voluntary efforts of its members, the All Sports Club seeks to enrich the educational experiences, expand post-graduate opportunities and enhance the citizenship of the student athletes. 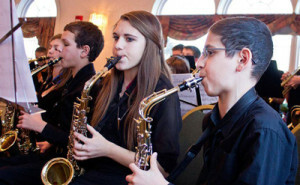 Friends of Music is a volunteer organization dedicated to fostering and enhancing the music education, performance ability and musical appreciation of all students of the East Greenbush Central School District.